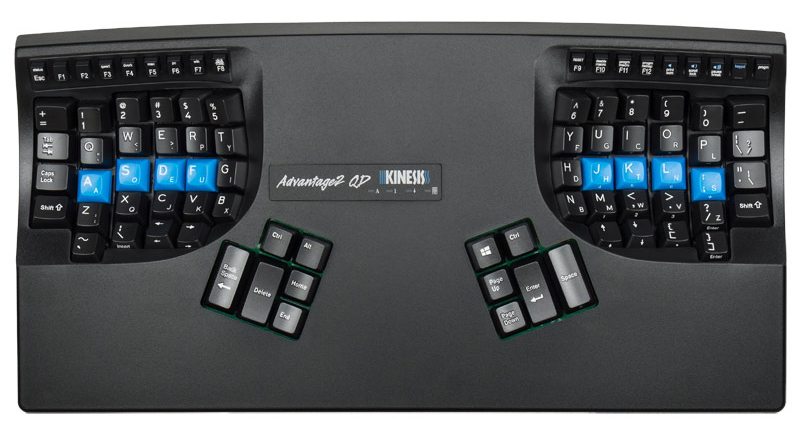 Kinesis has been hand-crafting professional-grade ergonomic keyboards for more than 25 years. 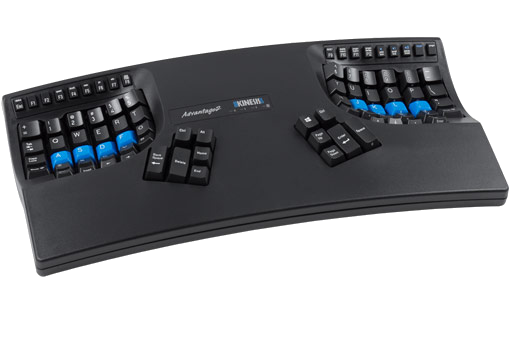 The Advantage2 features time-tested, contoured form-factor designed to address the major risk factors associated with keyboarding for maximum comfort. Split key wells position hands and arms at shoulder width to reduce ulnar deviation. Tenting elevates the thumbs slightly higher than the pinkies to reduce forearm pronation. Concave key wells place hands and fingers in a natural, relaxed position to reduce over-extension. 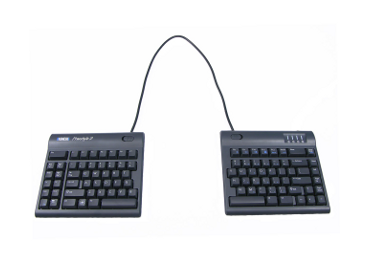 Thumb keypads transfer repetitive key strokes from the weaker pinkies to the stronger thumbs. 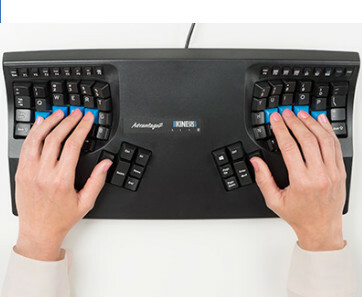 Vertical key layout mirrors the natural motion of your fingers to increase speed and comfort. Integrated palm supports and cushioned palm pads reduce harmful wrist extension. A smaller footprint reduces painful mouse over-reach. Numeric 10-key embedded in the right key well. 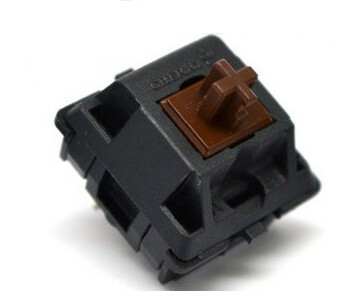 Low-force key switches provide amazing feel and durability. Choose linear Reds or tactile Browns. 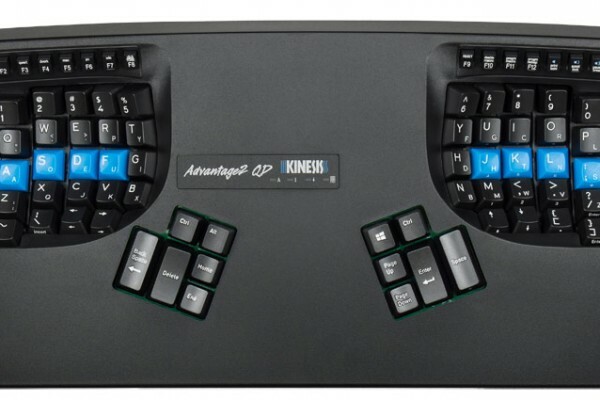 The fully programmable Advantage2 features Kinesis’s all-new SmartSet Programming Engine that allows you to customize the keyboard’s layout without installing any clunky software or special drivers, or accessing the internet. 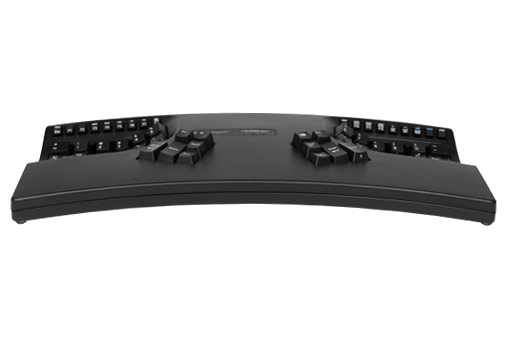 Record macros, remap keys, and much, much more. SmartSet works on all major operating systems and enables users to easily create, view, edit, share, and backup their custom layouts. 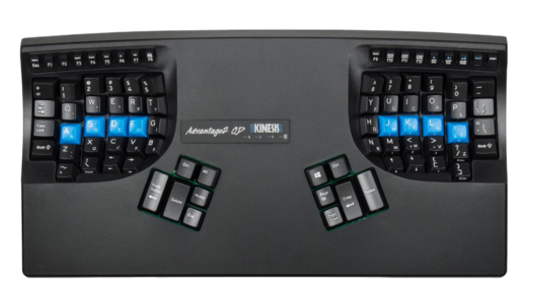 The Advantage2 is fully-programmable meaning that you can remap or copy a key to virtually any location on the keyboard. Escape key too far away… move it to tilde. Need a conventional arrow cluster… build it. Even add keys that aren’t on the Advantage2 using most standard Hex codes. The Advantage2 layout adjusts to you. 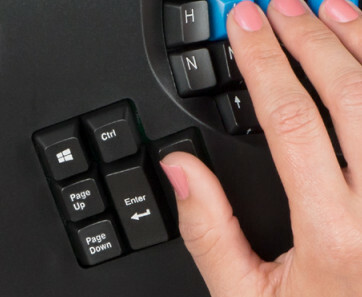 Macros are great for eliminating awkward key combinations or repetitive key strokes. The Advantage2 lets you record up to 100 heavy-duty macros (200+ characters) on-the-fly and save them to the keyboard’s onboard memory. You can even pull up the configuration file to view and edit your macros directly. Build and save dozens of custom layouts in either QWERTY or Dvorak. Each layout also has a 2nd embedded layer which can be remapped independently from the top layer, and accessed with a tap of the Keypad key or via an optional foot pedal. Switch to the standard Dvorak layout with the touch of a button and create custom Dvorak layouts with remaps and macros that are saved to the keyboard. Switch between QWERTY and Dvorak without losing any settings. With SmartSet, all your custom layouts are saved and stored as basic .txt files directly to the keyboard. These files can be opened with any text editing program, on any operating systems. 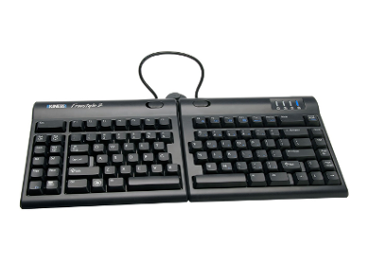 Edit your remaps or macros from the text file or insert new actions using the keyboard HID codes. You can also run a quick Status Report to confirm current keyboard settings. Since each layout on the Advantage2 is stored as a basic text file (typically less than 1KB), they are super easy to save, backup or even share with a friend. The days of rebuilding your custom layout from scratch are over. 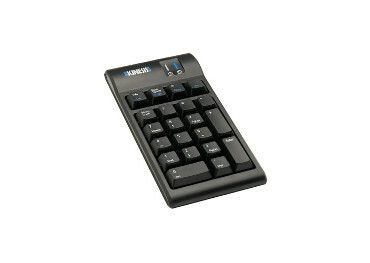 A traditional numeric 10-key is located in the embedded keypad layer of the right key well. 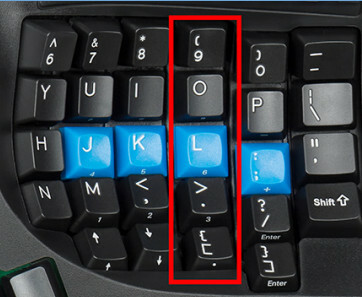 The 10-key legends are located on the front of the keycaps for your convenience. 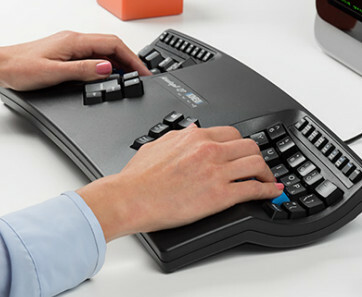 Use the Keypad key to toggle the embedded layer on and off, or press -and-hold an use an optional Advantage foot pedal to temporarily access it. When you invest in an expensive keyboard, you expect it to last. Thanks to the SmartSet engine, its easy to upgrade the firmware when new versions become available. And it doesn’t require opening up the keyboard or downloading a scary executable file (.exe). Choose from 9 different macro playback speeds. Set the playback speed globally for all macros or set it for a specific macro to optimise performance. Slow playback down to 4.2 characters per second (“CPS”), or speed it up to a blazing fast 250 CPS- equivalent to typing 3,000 words per minute. Macros are powerful productivity tools but accidentally triggering an unintended macro is frustrating and can have devastating consequences. That’s why we created an easy keyboard shortcut to temporarily disable all your macros. Macros aren’t deleted, just toggled off. 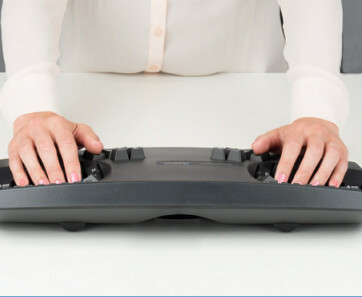 Volume controls are conveniently located the embedded layer of the function row but can be remapped anywhere on the keyboard. Additional media keys like Play/Pause, Forward and Back can be assigned anywhere through direct programming. 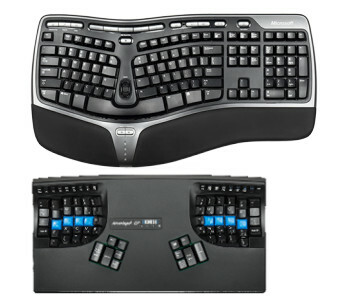 The key upgrades from the Advantage to the Advantage2 are below. 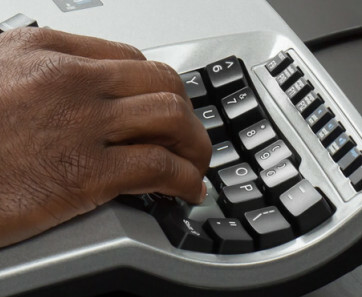 The function key row now features low-force Cherry ML mechanical keyswitches that offer a satisfying, tactile key press plus unmatched reliability and durability. 2 KB of onboard memory. The Advantage2 has 2 MB of memory, as in megabytes, which is 1000x more memory than the standard Advantage. Now you have an enormous amount of space to record macros and build custom layouts. Each custom layout built with the SmartSet engine can now support 100+ “heavy-duty” macros of more than 200+ characters in each. SmartSet allows you to create even more powerful macros through the direct editing process. Insert delays into macro playback of either 125ms or 500ms, or trigger different actions on the press and release of a given macro trigger. When you remapped a key or recorded a macro you had no easy way to track you changes or perform any updates. With SmartSet, all layouts are saved and stored as basic .txt files which can be opened with any text editing program on any operating systems. Open the text file and directly edit your remaps or macros. Even insert new actions using many standard USB hex codes. There was no way to share or backup layouts. You had to keep a separate crib sheet if you ever wanted to rebuild your custom layout. Each layout is stored as a basic text file making them easy to save, backup or even share with a friend. The days of rebuilding your custom layout from scratch are over. It was easy to forget which layout was active, which thumb key mode you were in and other keyboard settings. Thanks to the new Status Report feature, you can quickly “print-to-screen” a Status Report showing you basic information about the active layout include the number of key remaps and macros, and your thumb key mode. All macros played back at one speed. Choose from 9 different macro playback speeds. Set the playback speed globally for all macros or set it individually for a specific macro to optimize performance. Slow playback down to 4.2 characters per second (“CPS”), or speed it up to a blazing fast 250 CPS- equivalent to typing 3,000 words per minute! Only supported one custom layout. When you switched out of Dvorak you lost your settings. When you remapped keys in your Dvorak layout you did so in QWERTY. Dvorak is no longer a second-class citizen. Dvorak users get all the same functionality as QWERTY users, and each custom Dvorak layout is saved to the keyboard so it’s easy to move back-and-forth or share your keyboard. And when you’re remapping in Dvorak, you no longer have to translate from QWERTY. When you invest in an expensive keyboard, you expect it to last. Thanks to the SmartSet engine you can upgrade the firmware when new versions become available. Firmware updates take only seconds and don’t require opening up the keyboard or downloading a executable file (.exe) from the internet.